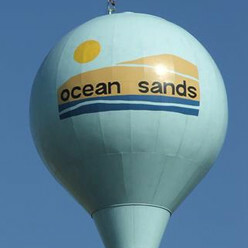 Ocean Sands in Corolla, NC is an Outer Banks beach vacation community that offers single family homes, condos, townhomes and duplexes. This area is subdivided into sections labeled A-Q, and each section has unique features and amenities that vacationers can choose from. Guests staying in many sections have access to a seven-acre fishing lake, which offers the perfect setting for an evening stroll or the recreational fisherman. Visitors enjoy seeing the indiginous wildlife in this area, including ducks and egrets. With its close proximity to things to do in Corolla, shopping and restaurants, you’re never far from everything you need on your vacation or getaway. Need groceries? Harris Teeter grocery store is right next door. Enjoy golf? The Currituck Club Golf Course can be found right across the street. Section F of Ocean Sands is home to Sea Loft Village, beautiful seaside townhouses that feature easy access to the beach only feet away from your front door. A convenient boardwalk makes the trek to your beach adventure that much easier, and a community pool and tennis courts are right nearby as well. Amenities in Sea Loft Village include cable television, dishwashers, microwaves, central air, and private parking.